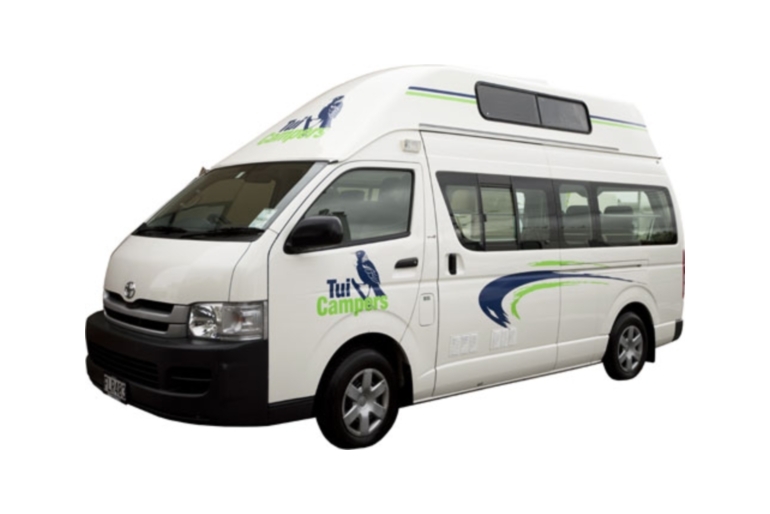 The HiTop Tui TrailFinder is one of Tui's most popular vehicles and it's easy to see why. 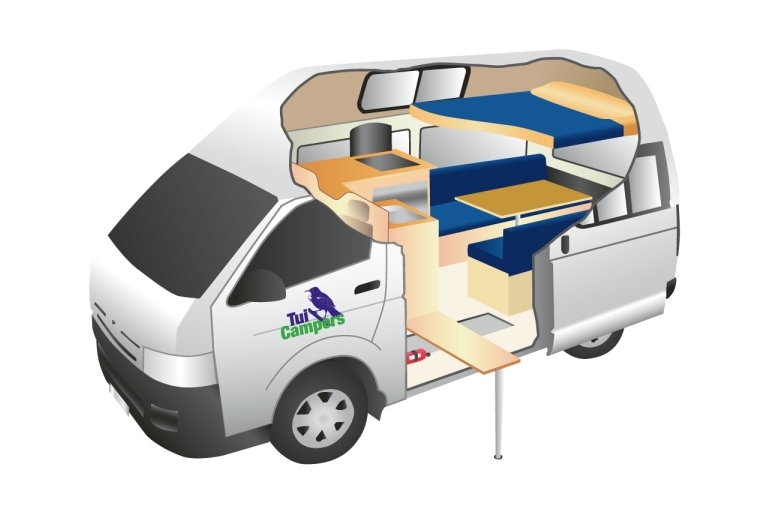 Creative design and clever use of space means 2 and 3 people can travel and live in total comfort. The driving cabin has seating for three with a Radio/CD Player and auxiliary (MP3/Ipod) input. The extra vertical space in the living area creates an airy, spacious feeling and ease of movement and a good-sized double bed and roomy single make for comfortable sleeping. Every drawer and cupboard reveals a surprise - fridge, stove, wardrobe, crockery, cutlery, linen, towels and much more. With the HiTop Trail Finder you not only get freedom and comfort to travel where you wish, you can also enjoy the economy and ease of an engine running on unleaded petrol with automatic transmission. Everything you need to take you to your New Zealand Adventure holiday. Capacity: 2 Adults, 1 Child. Baby Seats: Baby seat is to be fitted in the middle seat in the driver’s cab. Entertainment: AM/FM Radio/CD Player and auxiliary (MP3/Ipod) input. Engine Specifications: 2.7 litre, petrol. Gas Cooker: 2 ring cooker with grill ignited by match. Microwave: Operates off 240v when plugged into the mains supply. Gas Bottle: A 4.5kg bottle. The gas bottle is located in the external storage locker on the driver's side of the vehicle. The bottle has an 'ON/OFF' tap on it. Please ensure it is in 'OFF' position when not in use and when driving. Fresh Water Tank: Capacity is 42 litre. It is recommended to fill this tank daily. Heating: Fan heater in rear only. 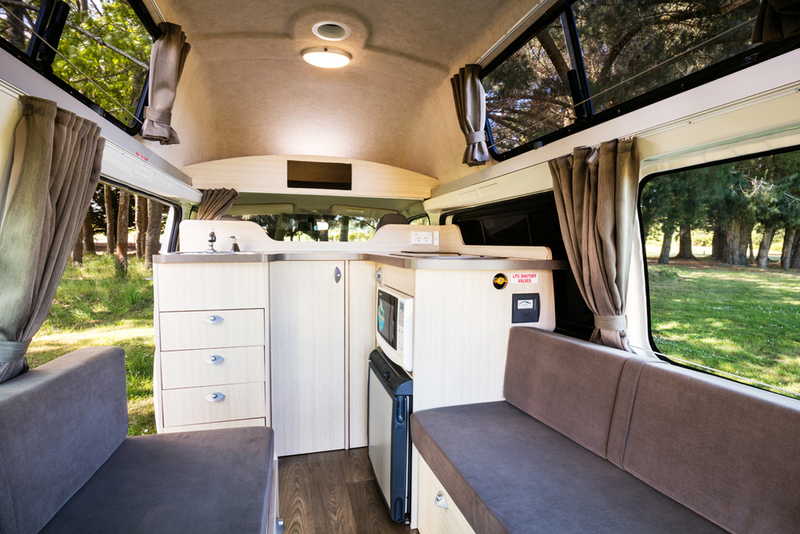 Fridge Freezer: The fridge operates on 12V battery whilst driving and on 240V mains when plugged in at a camp ground. The fridge will automatically switch over between the two supplies. Fridge capacity 55 litres. There are two 12V batteries, one for starting the engine and the other for domestic 12V system. This system includes a water pump and fridge. Batteries are recharged by engine alternator and 240V mains. Power Supply: 240V mains and 12V battery. The 240V mains power operates when the exterior power cable is plugged in at a camp ground. There are two 12V batteries, one for starting the engine and the other for domestic 12V system. This system includes a water pump and fridge. Batteries are recharged by engine alternator. 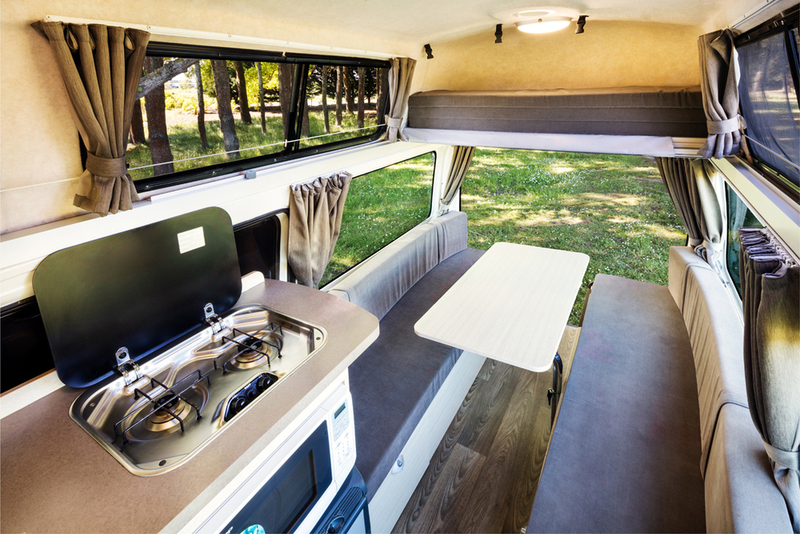 Storage: Ample cupboard space, storage under seats at the rear of the vehicle. Additional luggage storage at Tui Branches.